Nellie Lucille Shaw, age 95, of El Dorado Springs, Missouri, passed away Sunday, January 15, 2012, at Community Springs Healthcare Facility. She was born November 26, 1916, the ninth of eighteen children, to Samuel Jay Reedy and Martha Lela (Mitchell) Reedy, in rural Vernon County, Missouri. Nellie attended Lowe School east of Walker and graduated from Harwood High School in 1935. She along with her brother LeRoy and sister Martha were the first in the family to graduate. She married Wilbur A. Shaw on June 30, 1940, in El Dorado Springs, and then they moved to Salina, Kansas, to start their new life. They had one son, Edwin Jay Shaw, who lives in El Dorado Springs. Wilbur passed away September 10, 1995. Nellie was employed as a housekeeper for the Mental Health Unit at Asbury Hospital in Salina, Kansas. The year she retired, she was honored as the employee of the month. In 1982, after eleven years of employment at Asbury Hospital, Nellie and her husband decided to return to Missouri. She was a member of the ladies Auxiliary of VFW Post 257. 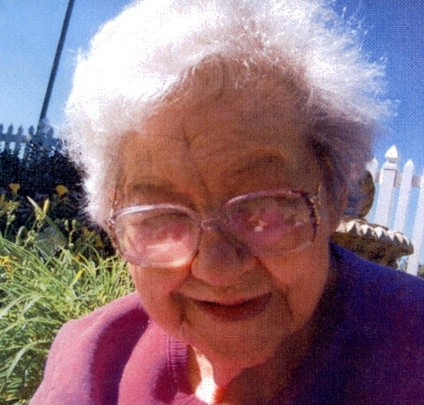 She enjoyed sewing and crocheting, and was always happy helping others. She enjoyed television, Bingo, and several other activities. She was very courteous and was always thinking of others before herself. Preceding her in death were eight brothers: Walter Guy, Thomas Robert, Joseph Anderson, LeRoy, Edward Jay, George Almon, Oscar Eugene, and Chester Dean; four sisters: Beulah May Dicks, Gladys Lenora Thompson, Bonnie Opal Rutherford, and Martha Blanch Lytle; as well as her parents and husband. Nellie is survived by her son Edwin Jay Shaw of El Dorado Springs; one brother, William Elmer Reedy of Gladstone, Oregon; four sisters: Sarah S. Hart of Rupert, Idaho; Eva Grace Smith of Butler, Missouri; Vivian Jewell Ellerman of Harwood, Missouri; and Betty Lou Pearcy of El Dorado Springs, Missouri; along with many nieces and nephews. Funeral services will be held at Bland-Hackleman Funeral Home on Thursday, January 19, 2012, at 2:00 p.m. with Rev. Ron Marsh officiating. There will be a visitation before the service from 1-2 p.m. Interment will follow in El Dorado Springs City Cemetery under the direction of Bland-Hackleman Funeral Home.